Australian natives, many bottlebrush (Callistemon spp.) varieties grow as 30-foot trees or large shrubs. Dwarf bottlebrush (Callistemon citrinus "Little John") is more compact. It was discovered in the 1980s by Ken Dunstan of New South Wales, Australia, and was named the 1986 Shrub of the Year in Australia. Bottlebrushes get their name from their showy, brush-shaped flowers. On "Little John," these flowers are red and appear in spring and summer. The leaves are blue-green, and stay on the plant year-round. Dwarf bottlebrush has dense branches that grow in a mounded shape that reaches 3 to 5 feet tall and 5 to 8 feet wide. The mature size is usually closer to 3 feet tall and 5 feet wide. This variety grows in U.S. Department of Agriculture plant hardiness zones 8 through 11. It will survive temperatures down to 20 degrees Fahrenheit, and may bounce back if all the leaves are killed by temperatures that drop a few degrees lower. With its spreading growth habit, dwarf bottlebrush works well as ground cover in full sun where other plants would wilt in the heat. Because the flowers are so striking, a single bottlebrush makes a dramatic accent plant in a larger design. You can also plant several in a line to create a low hedge. Dwarf bottlebrush becomes a workhorse in gardens designed for a particular purpose. The flowers attract hummingbirds and bees, so it makes a welcome addition to wildlife gardens. With its tolerance for drought, dwarf bottlebrush fits in well with desert landscapes or water-wise gardens. Because it tolerates salt spray, dwarf bottlebrush is a good choice for seaside gardens. Bottlebrush can grow back from the roots if the top part of the plant is destroyed, making it useful in firescaping. Dwarf bottlebrush produces the best flowers when planted in full sun. It is not picky about whether the soil is moist or well-draining, but does not grow well in highly alkaline soils. For container growing, it's a good idea to mix garden soil in with the potting mix to add minerals. Peat moss is also a good additive for bottlebrush, because it helps lower pH. If you want to make your own potting mix, combine 1 part each weed-free garden soil, peat moss and perlite. In the garden, space dwarf bottlebrush plants 2 1/2 to 3 feet apart. For container growing, start a young bottlebrush in a 12-inch pot that holds about 5 gallons of potting mix. 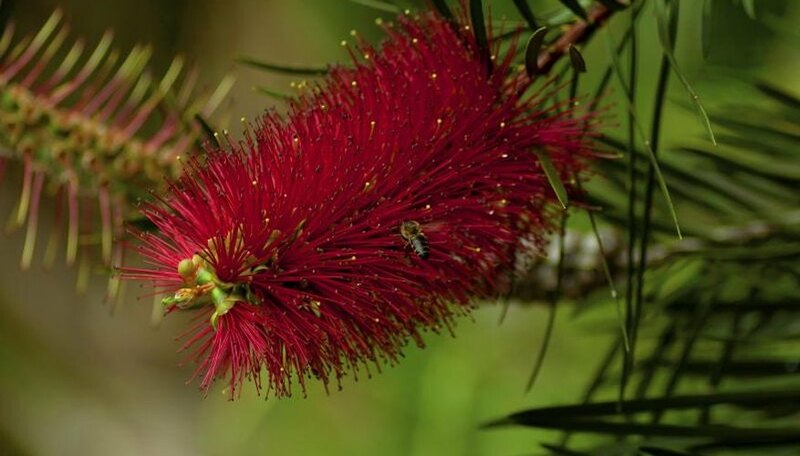 As the bottlebrush grows, move it to a pot one size larger each growing season until it reaches its mature size. Make sure any pot you use has drainage holes. In its native habitat, bottlebrush grows in moist areas. Once established, drought-tolerant dwarf bottlebrush needs little supplemental water. Dwarf bottlebrush may even become chlorotic, with its leaves turning yellow, in overly wet soils. This same problem can occur in alkaline soils where the pH is too high. If the leaves start to turn yellow in wet or alkaline soils, chelated iron fertilizers help mitigate the problem. Apply a chelated iron fertilizer at a rate of 3 to 5 ounces per 100 square feet to the soil during the growing season, or according to the instructions on the package. For regular fertilizer, apply a fertilizer to a dwarf bottlebrush once before new growth begins in the spring using a general-purpose fertilizer. Apply a slow-release fertilizer with an N-P-K ratio of 12-4-8 to the soil at a rate of 4 tablespoons per 4 square feet. Water the area well after applying the fertilizer. The best time to prune a dwarf bottlebrush is immediately after flowering. Prune lightly to shape the plant -- aim to remove a few inches to maintain an attractive, rounded shape. Hedge shears work well for this. Disinfect the cutting tools by soaking them in a mixture of 1 part bleach to 3 parts water for five minutes. Rinse the shears and let them air-dry before use. San Marcos Growers: Callistemon "Little John"